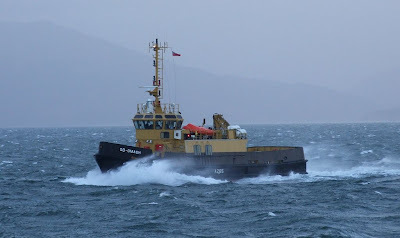 Also seen this afternoon kicking up the spray as she punched her way into the westerly gale was Serco Denholm's fleet tender SD-OMAGH, heading down firth to carry out some exercises. Like other vessels of the former Royal Maritime Auxiliary Service, SD-OMAGH has flown the Red Ensign since Serco Denholm was awarded the 15-year contract to provide support services around the UK's naval dockyards. Nice shots John. Took a leaf out of your book(instead of Mr O'Hara's lol) and opened up my own blog. Upper Clyde Shipping. I've been looking here daily. Enjoying your shots. John, this is the test you asked for.